The diagram shows a typical scale out web service with a load balancer distributing requests among a pool of web servers. 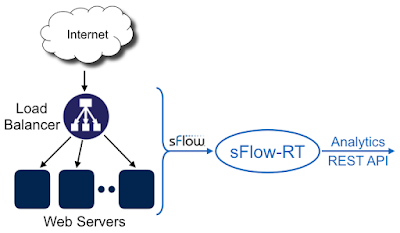 The sFlow HTTP Structures standard is supported by commercial load balancers, including F5 and A10, and open source load balancers and web servers, including HAProxy, NGINX, Apache, and Tomcat. The simplest way to try out the examples in this article is to download sFlow-RT and install the Host sFlow agent and Apache mod-sflow instrumentation on a Linux web server. Finally, the real-time HTTP analytics don't exist in isolation. The diagram shows how the sFlow-RT real-time analytics engine receives a continuous telemetry stream from sFlow instrumentation build into network, server and application infrastructure and delivers analytics through APIs and can easily be integrated with a wide variety of on-site and cloud, orchestration, DevOps and Software Defined Networking (SDN) tools. The diagram shows how new and existing cloud based or locally hosted orchestration, operations, and security tools can leverage the sFlow-RT analytics service to gain real-time visibility. Network visibility with Docker describes how to install open source sFlow agents to monitor network activity in a Docker environment in order to gain visibility into Docker Microservices. 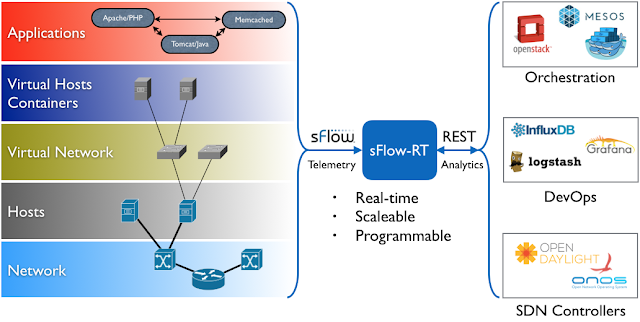 Configure standard sFlow Agents to stream telemetry to the analyzer and retrieve analytics using the REST API on port 8008. Run sFlow-RT Application. Drop the -d option while developing an application to see output of logging commands and use control-c to stop the container. Similarly, a Dockerfile can be used to generate a new image from published applications. Any required System Properties can also be set in the Dockerfile. This solution is extremely scaleable, a single sFlow-RT instance can monitor thousands of servers and the network devices connecting them.